It is that time again, time to go back and look at the offensive line. Hoorah! At the beginning of the year the offensive line was a serious question mark for this team, particularly the offensive tackles. Now, heading into our week 5 match up against the mighty Hoosiers, it is safe to say that I feel… uh… better. That being said, there is still much room for improvement, but I am optimistic that the line can continue to improve each week, they are still young and relatively inexperienced after all. It has been an interesting ride for the line (and the fans) to get to week five. # 75 Mike Adams (who I tagged to win the starting left tackle job in the preseason) was suspended for the first two games, leaving the job open for #55 Andrew Miller. Now Adams is back from suspension, got the first start of his career at LT against Illinois, and there is a magical OR on the depth chart between Miller and Adams heading into this weekend. I expect both Adams and Miller to continue to get playing time and to spell one another. Basically we are right back where we were at in the preseason. On the other side of the line, #64 Jim Cordle won the starting job at right tackle, suffered an ankle injury somewhere around the USC game and will be out of action for at least a few more weeks, leaving the position by default to #76 J.B. Shugarts (who I also tagged as the starter in the preseason, making me wrong on both accounts). When Cordle comes back from injury, I would guess that the RT spot will get the magical OR on the depth chart as well, reverting the competition at RT back to the preseason as well. Like I said, interesting ride. It's hard finding good pictures of lineman, but this one is cool. Thanks Jwinslow! Normally, you would think that open competition at both tackle positions heading into week five would be a bad thing because no one has separated themselves from the pack. That isn’t the case for the Buckeyes. I would attribute the lack of a clear starter at the tackle positions to surprisingly solid play across the board rather than frustratingly poor performances. I think the offensive line surprised everyone with how well they played against USC in week two against elite competition. Week three was a so-so performance for the line considering they were playing against one of the worst defenses they will face all year, which was somewhat concerning. Then last week happened. I feel like last week was a huge step forward for the offensive line and the entire offense. The Buckeyes were able to run the ball with authority the entire game despite the fact that Illinois knew we were coming at them on the ground. I think this success can be attributed to two things. One is that the offensive line is continuing to improve each week and I would say they are definitely starting to gel as a unit. The second reason for our success on the ground last week was schematic. Ohio State ran a large amount of their plays out of the shotgun formation and used a lot of option read plays between Pryor and the running back. This meant that Illinois had to protect the edge on both sides of the line because they didn’t know whether the ball was going one way with the back or if Pryor was keeping it and running the other way. The confusion this caused for the defense severely limited Illinois ability to pursue from the backside and helped to open up holes along the line. Throw in the fact that we pulled #86 Jake Ballard from the TE position on quite a few of the misdirection plays (something that I can’t recall ever seeing before) and it looks very much like Ohio State has turned a brand new page in offensive game planning. But back to the line. They played well last week and were consistently able to get a solid push up front. No matter what the schemes, if the offensive line doesn’t move people off the line the play isn’t going to work. We were able to move people last week. To get back to the whole competition at the tackle positions going into week 5 situation, like I said earlier, I don’t think that it is necessarily a bad thing. My worst fear in the preseason was that no one would separate themselves from the pack, leading to the situation we are in now. While no one has separated themselves from the pack so far, it is not due to poor play as I had feared, but rather because everyone has played relatively well up to this point. The combination of Miller, Adams, Shugarts, and Cordle have performed so well that the coaches have seemingly decided to redshirt all of their young guns along the offensive line in favor of using the depth at tackle to provide a rotation across the line. Take a look at the depth chart going into the weekend. You will notice that many of the starters are also listed at backup for other positions along the line. Andrew Miller is listed as an OR starter at LT as well as the backup at LG. Bryant Browning is listed as the backup at RT as well as the starter at RG. When Cordle makes his glorious return in a few weeks, the depth and versatility of the line will only improve and allow the coaches to use veterans as starters as well as backups along the line even more. This weeks veteran heavy depth chart is in stark contrast to the depth chart released in the first few games of the year in which freshmen Jack Mewhort, Corey Linsley, and Marcus Hall were all in the two deep. Now the freshmen are nowhere to be found, indicating two things to me. First I think it shows that the coaches would prefer to redshirt their freshmen linemen (update: Tressel mentioned on his call in show today that Hall will probably see the field this weekend). Second, and more importantly, it indicates to me that the guys in the two deep now are really stepping up their game and proving to the coaches that they can handle to load along the line. I have spent most of my time so far discussing the tackles, that is because the middle of the line has worked out exactly as I predicted with the Killer B’s (#65 Justin Boren, #50 Mike Brewster, #70 Bryant Browning) holding it down. While I wouldn’t call their play dominant just yet, they have been serviceable, and like the tackles, the way that the interior line played against Illinois has me feeling good about the future. 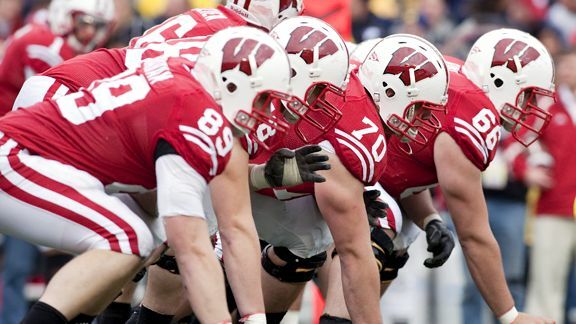 Cool picture, also the only other one I could find of the offensive line. So in summary, on the edge Miller and Adams are still rotating at LT, Cordle (when he returns) and Shugarts will most likely still be rotating at RT as well, and when Cordle and Miller aren’t on the field at tackle they will be providing depth on the interior. All of the tackles are playing well and it looks like they are getting better each week. On the interior the Killer B’s have been consistent and look to continue to get better as well. Basically, what looked to be a major question mark at the beginning of the year has proved to be a pleasant surprise (at least for now), and the line looks like they will only continue to improve. I mentioned this previously, but Ohio State has a favorable schedule until the trip to Happy Valley and it should give the line plenty of time to continue to gel and get better as a unit and individually. It looks like the Buckeyes are in pretty good shape along the line heading into week five.